The tire flip is one of the staples of strongman competitions. In all the strongman competitions I have ever competed in, I think the tire flip was in all but one of them. In order to excel at strongman competitions, you or your squad must get at least one tire in your collection of strongman paraphernalia, or run the risk of being ill-prepared when the contest comes. 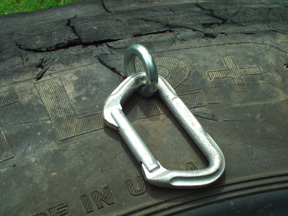 Tire shops and scrap yards will often give an industrial tire to strongman competitors for free because these outfits must pay to have them destroyed properly. 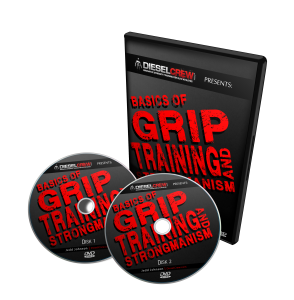 To unload one here and there to a new strongman enthusiast is a good opportunity for them to save some money for their business. Sometimes, the strongman upstart may get the tire home only to find out that it is just slightly beyond their limits in order to flip. Now what is there to do with this tire? Leave it in the corner of the lawn to collect spider webs? Is it a total loss? The answer is no. Just because a tire you have is too heavy for you to flip right now, does not mean it is just wasting space on your property or in your gym. I am going to show you how to deload the tire so that you make it easier to flip, gradually working toward flipping the tire all by yourself under your own might! All you need for this deloading set-up is a large eye bolt with a long, pointed thread and a large eye hole, a pen, a carabiner, a couple of strong JumpStretch bands, and that extra large tire! Step 1: Fasten the threaded eye bolt to the side of the tire. In my case, I was able to do this very easily because the tire was already cracked. 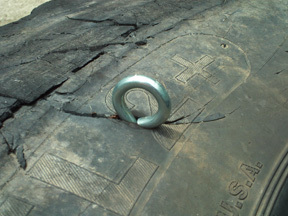 If your tire does not have blemishes like mine does, then you may need to pound a nail into the tire with a hammer about ¼ inch and then pull it out. The hole will be perfect for the point of the eye bolt to enter the tire. For additional leverage, you can pass a pen through the eye to keep it burrowing into the tire. Stop when the eye hole meets the rubber. Step 3: Attach a JumpStretch band to the carabiner. 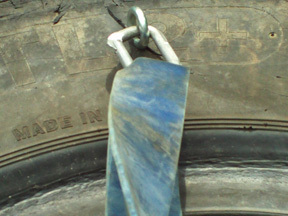 I suggest using either a green or blue band, especially if the tire is REALLY heavy. On that band, link another – you want to have several feet of pull distance, and two bands gives you the perfect length. Your deloading set-up for the tire is now ready. Step 4: Connect the end of the second band to a large, sturdy, fixed object, or have a partner hold onto it. The bands should be stretched so that their tension is fairly substantial. This tension is going to help you lift the tire to a vertical position. A partner works best for supplying the band resistance, as they can move backwards or forwards very easily to adjust how much help the athlete gets when attempting to raise the tire. Righting the tire with the help of the bands gave them the boost in confidence they needed and the next round, they each flipped the tire with no bands attached! 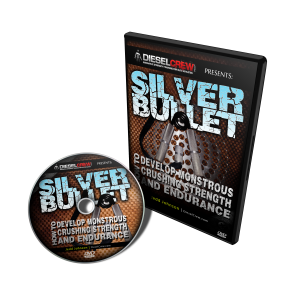 I think you will find that this deloading set-up will work great for getting you over the hump and pushing the big tires over to their demise. Another excellent use for this technique is for speed and repetition method with the tire. It’s not enough to be able to flip the tire just once to finish the tire event at the strongman contest. You must be able to flip the tire for sometimes a dozen repetitions and time is very important to your success! 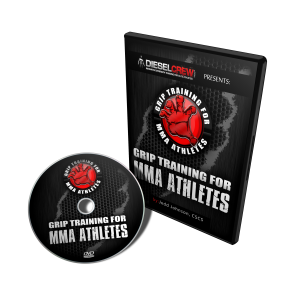 With that in mind, you can attach your deload set-up and complete several tire liftss – one after the other – repeatedly bringing it to the upright position, pulling it back over, and immediately attacking it right away to build your lung capacity, quickness in the flip, and stamina in the legs and lower back. You can emphasize quickness in the feet and speed in the hands, transition from a supinated grip to a pronated grip. In short, deloading the tire is a great way to build many facets of your strongman game without having to set-up multiple stations or use multiple tires, which saves you space at your facility and training time! So what are you waiting for? Get out there and get your deload set-up put together right away and give it a try! Once you give it a go, check back here and let us know how it worked for you! Ready to Take Your Tire Flip to the Next Level? This entry was posted on Friday, July 4th, 2008 at 4:32 pm	and is filed under athletic strength training lift odd objects, how to improve fitness and conditioning, strength training to improve athletic performance, strongman competition training, strongman training for athletes, strongman training log stone tire farmer. You can follow any responses to this entry through the RSS 2.0 feed. Both comments and pings are currently closed. Hey I was actually just wondering where I would BUY one of those tires, I mean I know its a great workout and everything like that ya know I’ve been involved in weight lifting for about seven years, just looking to expand my view on workouts. Go to a tire scrap yard. they are generally free there.